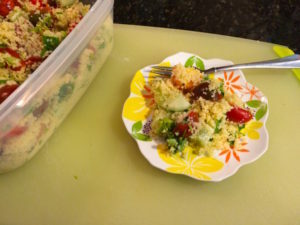 Couscous salad has a lightness that goes well with summer veggies and the grill. I’ve developed this couscous salad with Mexican flavors for that lime and cilantro freshness. 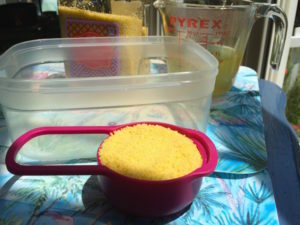 You will need a pot or rice cooker, measuring cups or spoons, knife, lime squeezer, and a large bowl. Bring 1 cup of chicken bouillon to a boil. Remove from heat and add one cup of couscous and cover the pot. Absorbing the liquid will take about 5 minutes. Fluff with a fork. Cool. Tri-color couscous adds a festive look. This couscous gets its color from spinach and tomato or paprika. To make this a vegetarian dish, use vegetable bouillon. Juice a lime for 3 tbsp of lime juice. 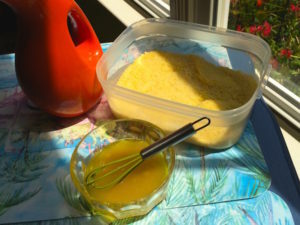 In a small bowl or measuring cup whisk the juice with 2 tbsp olive oil and 1 or 2 cloves of minced garlic. Pour dressing into the couscous and mix gently with a fork. Chop a ½ cup fresh cilantro leaves. Slice 1 ½ cups grape tomatoes in half. Dice a half cucumber into cubes. 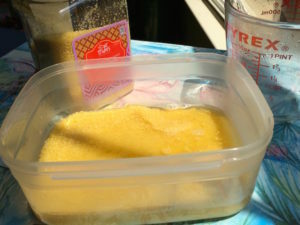 I scrub mine with a brush and leave the skin on for extra fiber and color. 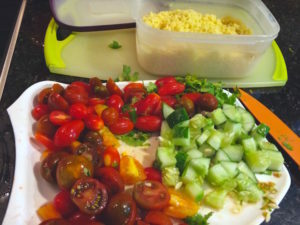 Combine the cooked couscous, cilantro, tomatoes, and cucumber in a bowl. Add salt and pepper to taste. Mix gently. Keep refrigerated. You may want to add extra lime juice before serving, or serve with lime wedges. Serves 4. Bring 1 cup of chicken bouillon to a boil. Remove from heat and add one cup of couscous and cover the pot. Absorbing the liquid will take about 5 minutes. Fluff with a fork. Cool. In a small bowl or measuring cup whisk the lime juice with olive oil and garlic. Chop the fresh cilantro leaves. Slice the grape tomatoes in half. Chop the cucumber into cubes. Keep refrigerated. You may want to add extra lime juice before serving, or serve with lime wedges. Tri-color couscous is recommended. You may enjoy adding kalamata olives, sliced fresh banana peppers, or fresh oregano. 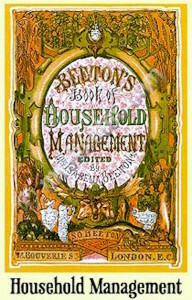 For vegetarian, replace the chicken bouillon with vegetable. You may enjoy adding kalamata olives, sliced fresh banana peppers, or fresh oregano. You can change the recipe to match your meal by replacing the cilantro and lime juice. 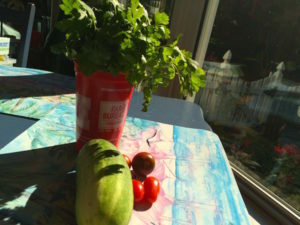 For a Mediterranean salad, use lemon juice, mint, and parsley. For Italian-style, use lemon juice and basil. For Thai-style, use lime juice, fish sauce, chili sauce, and cilantro and add some chopped peanuts. Hawaiian-style: use coconut oil to replace olive oil, replace the cucumber with chopped pineapple, and use flaked coconut. Let me know if you think of more variations! I’ll be looking for comments below, or contact me at lisa [at] thecasabouquet[dot]com. This couscous salad is so good with summer’s fresh tomatoes. As a side with grilled chicken or salmon, I love the Mexican flavors of lime and cilantro. This is very quick to make and a crowd pleaser as a vegetarian option. I’m wondering if I can sub quinoa instead!! Looks so refreshing! Thanks for stopping by, Sarita! I based this on a tabbouleh made with bulghur wheat. I substituted cous cous, now you can try quinoa! Let me know how it turns out.